At home, in the dorm room, or at work, life tastes great when there’s cake in your cup. Sharon Tracy’s travel-ready chocolate soufflé cake is a delicious way to send warm wishes to faraway friends and family. 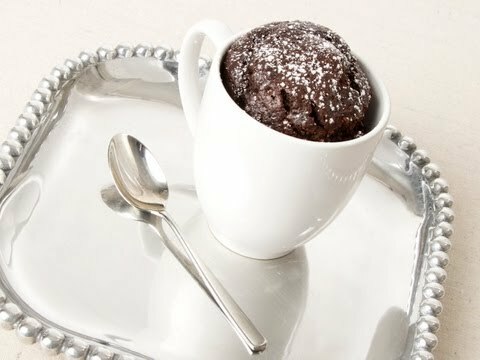 The chocolate soufflé cake, which bakes in its own ceramic serving mug, is the real deal—light, airy soufflé combined with the gooey, melt-in-your-mouth decadence of molten lava cakes. Each all-in-one kit, dubbed My Cup of Cake, includes a 16-ounce ceramic mug and chocolate soufflé cake mix. All you have to do is add water, mix, and pop the mug in the microwave for three minutes. Voila, you have a rich soufflé made with natural, nut-free ingredients such as Belgian chocolate and hand-rolled caramels. There are no trans fats, artificial flavors, or preservatives. You can choose Sharon’s classic recipe, salted caramel, or raspberry. My Cup of Cake has all the taste but none of the time commitment or mess of baking from scratch. It makes the perfect gift for birthdays, get-well wishes, teachers, or anytime “thinking of you” occasions. When you can’t be there to bake a cake from scratch, My Cup of Cake delivers. It's the perfect long-distance treat for someone special. 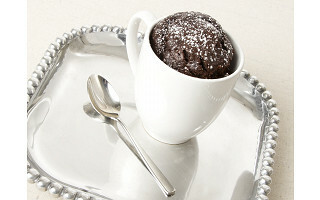 Microwave soufflé cake in a mug that can be prepared in under 3 minutes. All natural ingredients. Nut-free. Hello Grommet Community! 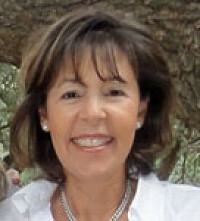 I'm Amy from the Daily Grommet Team, filling in for Sharon Tracy, founder of My Cup of Cake. Unfortunately Sharon is traveling today, but she had given us every confidence that we will be able to field your questions. At the office we have been enjoying My Cup of Cake, and can't wait to share it with you! Hi! Question about package content... Is it $22.95 for the mug and just mix for one cake? Or do you get a few mixes in with the initial order? The $22.95 option includes the mug and all the high quality ingredients to make one souffle. Let us know if you have any more questions. This is likely to be a popular one. I don't use a microwave, can it be done in an oven? @lorena broesamle Hi Lorena, Yes this can be cooked in the oven as well. You can find this information on the "details" tab next to the "story" tab on the launch page. Be sure to let us know if you have any other questions. This looks really yummy. What is the flavor of the Classic cake mix ? Is it Chocolate ? Also can you split the cake mix in 2 parts to make if you don't wanna bake all at once ? The classic cake mix is chocolate. It's recommended to use the whole mix at once as it should be used once it's opened, however if you are really interested in making a smaller amount, it will likely work just not make as much cake. Be sure to let us know how you like it. At home, in the dorm room, or at work, life tastes great when there’s cake in your cup. Sharon Tracy’s travel-ready chocolate soufflé cake is a delicious way to send warm wishes to faraway friends and family. The chocolate soufflé cake, which bakes in its own ceramic serving mug, is the real deal—light, airy soufflé combined with the gooey, melt-in-your-mouth decadence of molten lava cakes. 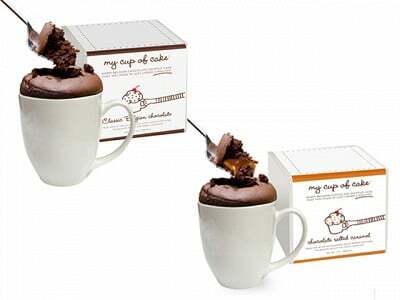 Each all-in-one kit, dubbed My Cup of Cake, includes a 16-ounce ceramic mug and chocolate soufflé cake mix. All you have to do is add water, mix, and pop the mug in the microwave for three minutes. Voila, you have a rich soufflé made with natural, nut-free ingredients such as Belgian chocolate and hand-rolled caramels. There are no trans fats, artificial flavors, or preservatives. You can choose Sharon’s classic recipe, salted caramel, or raspberry.